I'm taking on a Family Force 5 concert that's actually already happened; it was a minor show that I was able to attend and photograph, but I'm going to treat it as a larger event. Most of their personal tour posters are fairly old even though they're on the road all the time. This event is a post-game concert for an NBA game in Atlanta. 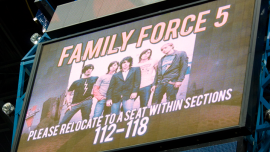 Tickets for the game give access to the concert and could be purchased through several venues, but TicketMaster offered a discount using Family Force 5's initials, which was heavily promoted by the band. FF5 is branded as crunk rock, an eclectic mix of hip-hop, heavy rock, dance, and screamo elements, yet they prefer family-friendly lyrics and imagery compared to others of the genre. Their personality is generally that of total goofballery. I went through a bunch of thumbnails and sketched out a few concepts that I thought worked in different ways. Most of the rough drafts work as illustrations, and while I'm fairly confident in my drawing ability I wanted a more designed approach. Some of the concepts work as general tour or publicity promo materials or as stand alone illustrations rather than work for this event. I've pretty much decided on the idea of a scoreboard for several reasons: it highlights the duality of the NBA game and the concert; I can fit or scale back as much information in type as needed; and I have good reference photos from personally attending. I'm excited to use some of the visual effects of an LED scoreboard, though I'm not sure how to achieve them. Good opportunity for learning!